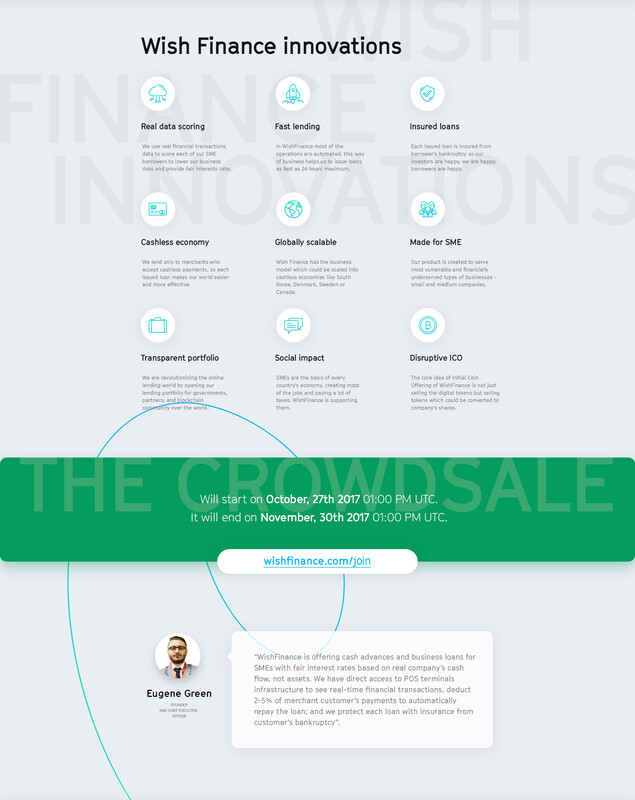 We are pleased to announce WishFinance ICO campaign. Join our Telegram Chat and Stay tuned! Bounty Campaign = to be announced soon! Join our Telegram Chat and Stay tuned! Official website showing some figures around $500k has been issued in current so you have any kind of working blockchain app to see the statics there. Good point is that you generated decent revenue in short of time of with limited capital so if you will raise huge amount than profit will also increase. I will follow this sounds interesting. Could I get a link to download your white paper? I have seen some projects of lending platform like this but all of them stopped in one thing: Collateral. How will you guys handle this? I read that you have insurance from bankruptcy, but where does this money come from? You can find the link in OP anyway I posted it for your comfort now it will be much for you to understand the vision of this team. Interest rate shared with an acquirer, the liquidity provider and part go to the insurance fund. Very interesting with a little token supply can be assured the price will be high by the way what benefits will be obtained if participated in this ico. do you have bounty for signature campaign and translation? for the recent icofalls it is very rare to have ICO backed by the real business. Will watch it closely with intention to get the rank of investor. Hi, yes, we've just started the bounty campaign. Please, refer to this link: https://bitcointalk.org/index.php?topic=2247753 We'll be glad to answer your questions.